Alaska single carport - Jagram-Pro S.A.
Alaska Single Carport was designed for smaller spaces. Made of high quality laminated timber. 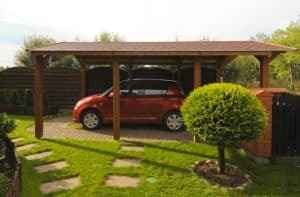 Its modest size enables installing a carport in location where a regular garage would be impossible. A wooden garage is resistant to weather conditions, thanks to which it can also serve as a woodshed or a different utility room. Our wide range of carports provides the opportunity to match their canopies to your own requirements. 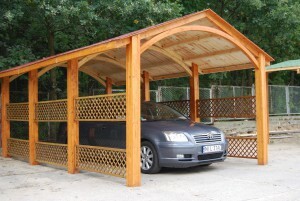 Our Alaska carport is a car shelter-type structure, made entirely out of structural, bent laminated timber. The number of spaces above shows how many vehicles may be stored. 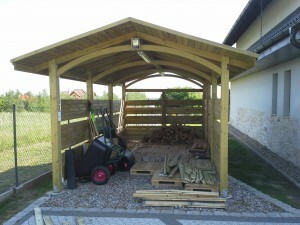 The quality of wood used for the carport is governed by strict guidelines verified by our quality controllers, from the moment sawn timber enters a Jagram-Pro S.A. Susz manufacturing plant, to packaging and shipping via our transportation, or external forwarding, all over Poland. Each of our structures is modular, which means that every element can be replaced with a different one, and are prepared to support additional equipment, like in the case of an issue with the height or width of a structure. It’s not always easy but it’s still feasible and, therefore, the Alaska carport is a good solution. After ordering, payment and receiving the structure – the Alaska carport arrives ready, in parts for individual assembly. Individual, since the installation does not require non-standard tools or equipment. The necessary prerequisite is the minimum number of people present for installation, which is 3. Although, in these times of comfort, it is normal to hire a company to assemble the structure. Even with a finished structure, provided there is adequate protection, we are able to move a finished structure from place to place. In particular cases, it is the key solution to the problem. There are situations where structures have to be disassembled. Quite often this hapens in manner which is irreversable, meaning that stability can be lost or making it completely impossible to reassemble. With our products, multiple assembly and disassembly is possible, due to the modular system and ease of installation. The reassembled structure has the same properties as the original installation. The moving itself, and multiple assembly and disassembly are possible due to the properties of bent laminated timber. It is extremely durable, has a great load bearing capacity, and is also light. Glued with special polyurethane adhesives. Pressure impregnation is the first stage of protecting wooden elements in finished structures, with the next one being coated with a UV agent at the discretion of a customer and systematic maintenance in order to ensure several years of unchanged material durability. Once again, taking advantage of the fact that our structures are made from timber, without special tools, skills and equipment, we are able to modify an existing structure, adding, e.g., wall enclosure. It all forms a light-weight, modern, professional and cost-efficient structure. 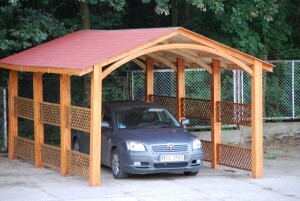 Wooden carports do not differ and often surpass standard solutions.